As a result of enjoying the new DC Universe Action League line, I’ve started picking up the few Batman: Brave and the Bold Action League two-packs I can still find in stores. This has become more challenging since the line was cancelled, but luckily I stumbled across a Batman vs. The Gentleman Ghost at my local TRU. 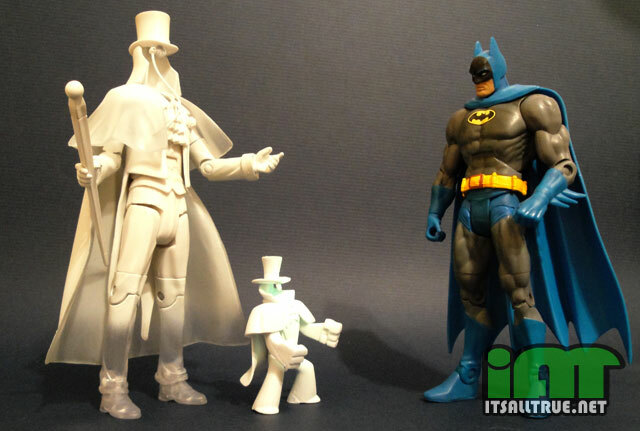 If you told me five years ago that I would own a Gentleman Ghost action figure, I would think you were crazy. Not only was he a minor character in the DC Universe, but he didn’t have a head, which is an important feature in a toy that wears a hat and monocle. But the Brave and the Bold cartoon featured him as a recurring villain and the folks at Mattel came up with the simplest solution for the figure by attaching the monocle to the hat, and the hat to the character’s collar. Genius! 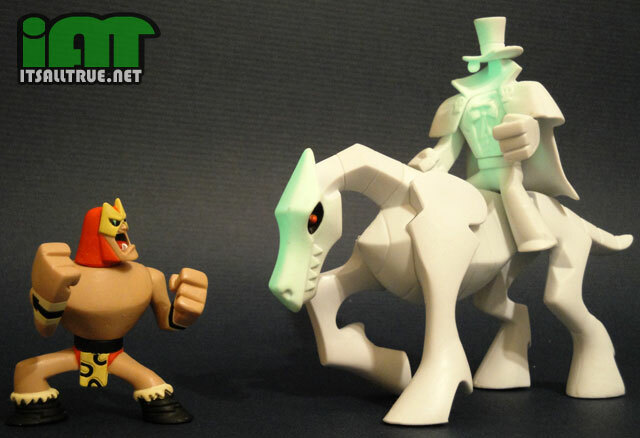 The Gentleman Ghost barrier had been broken and Mattel was going to push it to the fullest extent. Gentleman Jim fans have been in toy heaven over the last couple years as Mattel has released five different figures: DC Classics, Justice League Unlimited, Batman: Brave and the Bold, and two Brave and the Bold Action League figures. The first Action League figure was completely translucent and came in a six-pack. 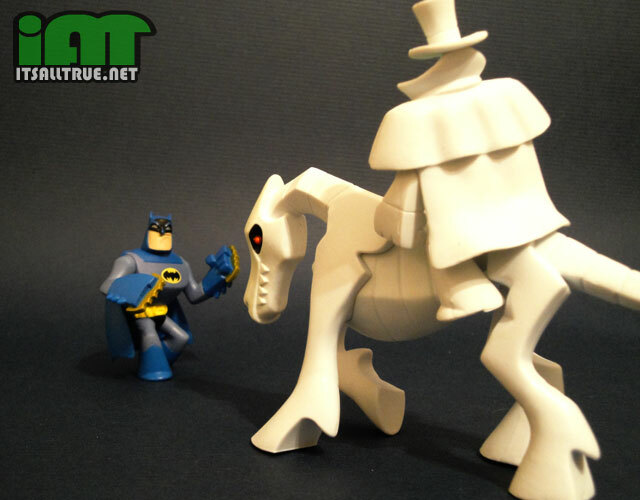 The second was white and came in a two-pack with his horse and a Batman (of course). Both figures have the typical Action League articulation: swivel joints at their head, shoulders, and waist. 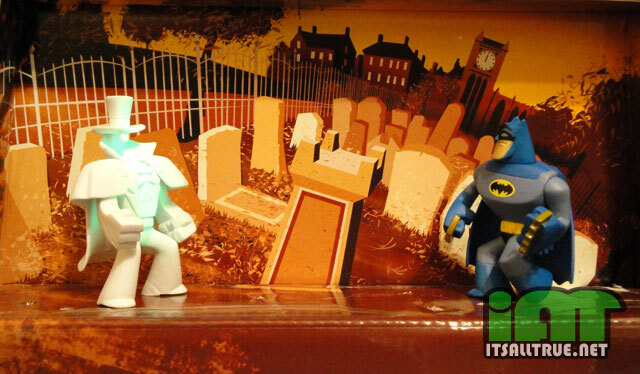 Sadly, Gentleman Ghosts’ is limited by his cape. This means he can only go for gut punches, but that’s OK. Since he was a highwayman, I’m sure he fought dirty most of the time anyway. The Batman is just one of many produced in this line. But I have to admit, I like this one more than most. I think it’s the extremely scowly scowl on his face. He also comes with his patented Nth Metal knuckles, just for punching intangible foes. But I bet they work on the tangible ones also. Gentleman Ghost is molded in all white and given a layer of glow-in-the-dark paint on his front torso (more on that later). Mattel once again uses their state-of-the-art monocle/hat/collar technology, which also works perfectly in this scale and style. Speaking of style, I really love the cute little cartoony skull clasps on his cape. But I was disappointed that he didn’t come holding his cane. He could have really used a weapon, especially with that limited reach. What makes this two-pack stand out most is the Gentleman Ghost’s skeletal steed. Not only is it huge, but it’s got evil red eyes and serrated teeth. Talk about nightmare fuel. Plus, this horse has been cursed with an immortal undead existence, so you know his attitude isn’t too pleasant either. The only downside to the figure is its complete lack of motion. I don’t expect much articulation out of these little guys, but Mattel really skimped here. I would have at least appreciated a hinge joint for the neck so he can look up at least. Now for my favorite feature of this set. 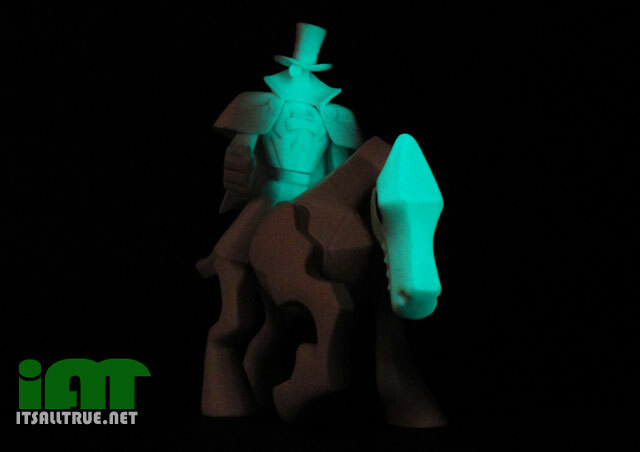 The front of Gentleman Ghost and top of his horse’s skull were painted to glow in the dark. Normal glow-in-the-dark is cool, but this has been painted on, making it way more vibrant than if it were mixed into the plastic. In the dark, these two burn with an eerie teal, but the paint is so potent that you can even see it in light. I didn’t even need to enhance it with photoshop. If you’re like me and are starting to feel the pull of Action League, you definitely need to pick up this two-pack. The Ghost and his horse are worth it alone, but the glow-in-the-dark feature is so brilliantly bright that I can’t help but charge him up when I see him sitting there. Plus, he’ll look great when we get a Hawkman. the glow effect came out pretty cool on him. these mini-figs aren’t my bag, and my boys have outgrown them (but they still like the superhero squad cartoon) but for those into them, these look like fun. They are pretty fun. After buying a few of the older Brave and the Bold ones, I appreciate the style more. I’m amazed at how many unique pieces with specific sculpting exists in the line. I underestimated it by just thinking it used mostly reused parts.